The purge is underway. 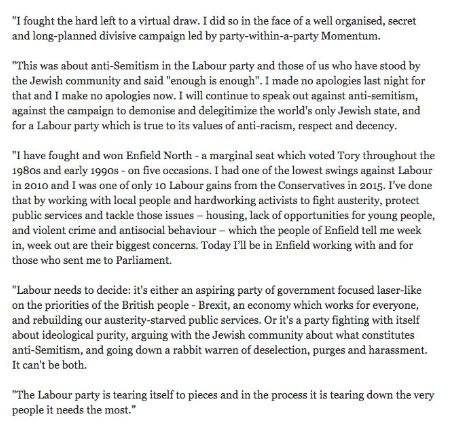 As Jeremy Corbyn is labeled an anti-semite and the party twists and turns over its attitude towards Jews, Labour Party members called for a vote of no confidence in Labour MP Joan Ryan, The Enfield North MP, who just so happens to chair Labour Friends of Israel. She has been a vocal critic of Jeremy Corbyn’s handling of anti-Semitism in the ranks. You can see the vote on Press TV, which filmed and live tweeted the vote. Press TV is the Iranian State broadcaster banned from broadcasting in the UK since 2012. On it you used to be able to watch such presenters as George Galloway, Yvonne Ridley (this might be her discussing an anti-semitic mural with Corbyn) and, of course, Corbyn, the Labour Party leader who reportedly received up to £20,000 for appearing. Perhaps the Press TV reporter is a Labour Party member? After all, it only cost £3 to join, and look at the mayhem you can cause. And isn’t banning Press from political meetings foolish? It’s almost impossible to implement. But Labour HQ showsw us its clean hands and says: “Filming of local Labour Party meetings is not permitted, and Enfield North will be reminded of this fact.” Only a few days ago, Labour was stating its commitment to ‘free speech’. Admittedly, it was hard to hear the noble cry over Corbynistas calling for Israeli musicians, speakers, actors, artists, medics, scientists and politicians to be no platformed. We have documented an amazing amount of Jewish support for Jeremy Corbyn over the past week. Both at the #NEC debate on #IHRA and at the Enfield North #JoanRyan vote.